WOW...It's week 47 of the Bloggers Challenge. What started out as a fun little challenge between Sheryl and myself has really grown into a great talented group of challenge players....This weeks challenge was to use this sketch (the one with the dog) as a basis for creating your card. Other - Tool Kit, Horizontal Slot Punch, Clear EP, Aquapainter, Afternoon Tea DSP, Chocolate Chip Twill, Hodgepodge Hardware. For this card I used the Magic Pattern Technique (TJNL) coloring my images with watercolor crayons. If you'd like to play along with this weeks challenge, simply upload your artwork to your blog and leave a link on this post, or if loading to SCS use keyword BC47. Both cards are beautiful Lisa. Love all the techniques you used, it add so much interest to your projects. Lisa, you've done it again! You've made two superb cards!! Both are just stunning eye catcher's. You rock! Both cards are wonderful, Lisa. I especially love the first one (since I have that set!) Great job with the layout! How pretty these both are! Just lovely!! 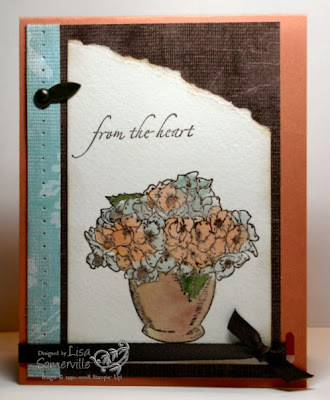 Every card I've seen with Bloomin' Beautiful has been just that....beautiful! And this one is no exception. Of course, your other addition is fabulous as well. This was a fun challenge. Although they are both great - my fave is the first one! I love earth tones! Wow, I love both of these Lisa. I so wish I would have bought that first set but it is too late now, lol. You have made some amazing cards with that set. Gorgeous card!!! I love that technique on the 2nd card, really makes the image POP! I love them both, miss Lisa, but the Bloomin' one is my fave since that is my fave stamp set this season! You do such pretty work! Both cards are just beautiful! 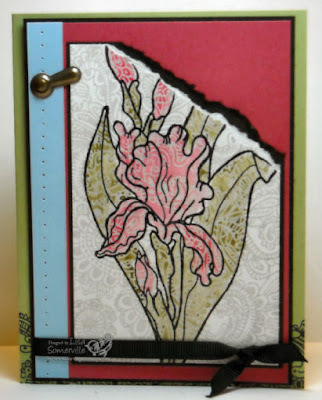 You know I love the flowers in the vase--each card you make with it is weakening my resolve to NOT buy it! It's been a fun 47 weeks and look forward to the next 47 (and more)!!!! Wow, 2 cards today! (again)...luv them both, wanna' come play with me? We could have fun! Both are gorgeous. Great details on the SU card, and, of course, the magic pattern is beautifully executed. Lovely cards Lisa, It's hard to pick a favorite this week as they are both very appealing. I think that the technique you used on your 2nd card is interesting and will need to check that out. Both cards turned out lovely, Lisa!!! I like you used DSP as an accent and that you used your slot punch to attach the ribbon! Both of these are beautiful! Love all of the techniques you do too! TFS! Lisa, these both turned out beautifully. I especially love the soft colors in the first card. both cards are wonderful! I love the color combos you used! Gorgeous cards, Lisa. Your first card is so pretty and makes me want to play with Bloomin' Beautiful more! Great card layouts. Esp. love the colors on the top card.